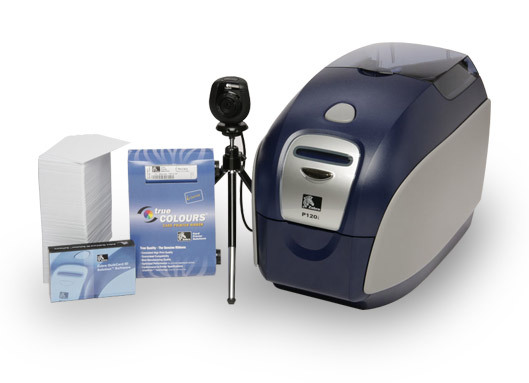 Set up your card printing system and begin producing full-color photo IDs in minutes with the Zebra QuikCard ID Solution - no software expertise necessary. The feature - and value-packed kit includes everything you need to quickly, easily and cost-effectively make professional-quality identification, security and commerce-related cards. In addition to a Zebra Value class full-color, single-sided P110i or dual-sided P120i card printer, available with or without magnetic encoding, it contains exclusive Zebra QuikCard ID Solution Software (optional upgrade to professional version available) featuring Zebra Card Design Templates and Template Designer - making it exceptionally simple and fast to create custom cards. You also get a USB digital webcam with a tripod for capturing ID photos, and supplies for printing up to 200 cards. With this high-value and easy-to-use solution, even smaller organizations have the power to print cards with the quality and professional appearance required in today's market.